In music, a time signature tells you the meter of the piece you’re playing. Composers decide the number of beats per measure early on and convey this information with a time signature. The two numbers in the time signature tell you how many beats are in each measure of music. A piece with a time signature of 4/4 has four quarter note beats; each measure with a 3/4 meter has three quarter note beats; and each measure of 2/4 time has two quarter note beats. A time signature of 4/4 meter does not mean that each measure has only four quarter notes. It means each measure has only four beats. These beats may contain half notes, quarter notes, eighth notes, rests, whatever the composer wants, but all note and rest values must combine to equal no more or less than the top number (or numerator) of the time signature. You can recognize the tunes of three common time signatures. The most common meter in music is 4/4. It’s so common that its other name is common time and the two numbers in the time signature are often replaced by the letter C. In 4/4, the stacked numbers tell you that each measure contains four quarter note beats. So, to count 4/4 meter, each time you tap the beat, you’re tapping the equivalent of one quarter note. In the second most common meter, 3/4, each measure has three quarter note beats. Of course, this doesn’t mean that only quarter notes exist in this meter. You may have one half note and one quarter note, or you may have six eighth notes, but either way, the combination equals three quarter note beats. In 3/4 meter, beat 1 of each measure is the downbeat, and beats 2 and 3 are the upbeats. 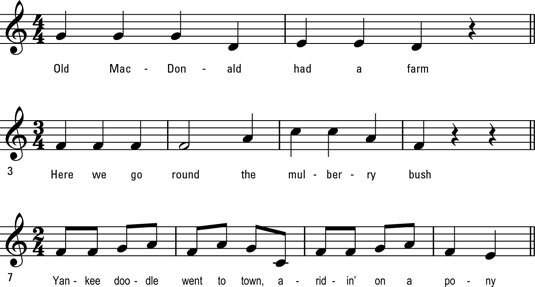 It’s quite common, though, to hear accents on the second or third beats, as in many country music songs. Chop a 4/4 meter in half and you’re left with only two quarter note beats per measure. Not to worry, though, because two beats per measure is perfectly acceptable. In fact, you find 2/4 meter in most famous marches. The rhythm is similar to the rhythm of your feet when you march: “left-right, left-right, 1-2, 1-2.” You start and stop marching on the downbeat — beat 1. If you notice that a time signature of 6/8 doesn’t have a “4” in the bottom (denominator) position, you’re no doubt already thinking that it can’t be a meter based on quarter notes. If you’re thinking that it might be a meter based on eighth notes, you’re right on time. 6/8 meter is a grouping of six eighth notes per measure. Like the waltz, beats in 6/8 meter are grouped in threes, but there are two groups. 6/8 has an added down-up beat pattern on the first eighth note of each group — beats 1 and 4. Showing the emphasis using italics, you count a measure of 6/8 with one count for each eighth note beat, as follows: One, two, three, four, five, six. Beat 1 is a stronger downbeat than 4, so this beat pattern can feel like two broader beats (down-up), each with its own down-up-up pattern within.